Hello! If you're here visiting from Beneath My Heart, welcome! I'm so glad to have you here at Imparting Grace. If you're a regular here at Imparting Grace, I'd love for you to visit me at Beneath My Heart and see my new kitchen window treatment. Tuesdays around here are devoted to gaining ideas for real-life dinners over which I do not have to slave and which my family will actually eat. I'm amazed at how my family wants to eat dinner every night. Every night! They're always hungry, it seems. That fact prompted me to start my Dinner for Real series, and I hope you'll get some good ideas of real-life, kid-approved recipes that are both practical and tasty. Today we have a special treat--a guest post from my blogging buddy Heathahlee. You may know her from her beautiful blog, Butterfly Genes, or from the Etsy Shop where she sells her gorgeous handmade tassels. If you don't already know her, this is your lucky day! Read on to meet Heathahlee and learn how she makes one of her family's favorite recipes. 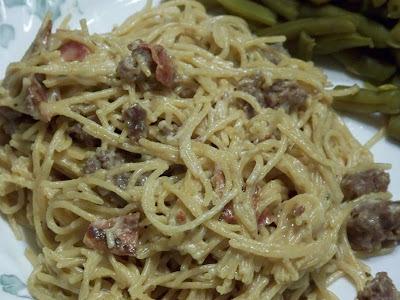 One of our favorite meals is called Pasta Carbonara. It's really not a Carbonara, I guess, since it doesn't have eggs in it (I've seen other "Carbonara" dishes and they've all had eggs in them). But, it is one fine and tasty recipe my friend Jennifer gave me several years ago. She also called it Sausage Spaghetti, but I think that makes it sound too much like normal spaghetti. Take one pound bulk breakfast sausage and brown with 5 to 7 pieces of bacon that you've diced. You can also use bulk Italian Sausage, too, and if you do, you can leave out the next step. See the stuff on the wooden spoon? When I use regular sausage, I put in about a scant teaspoon each of oregano and basil. Makes it more Italian-y. As that mixture is browning, add one minced clove of garlic and stir it in really well. Whilst that is browning, boil some Angel Hair pasta. 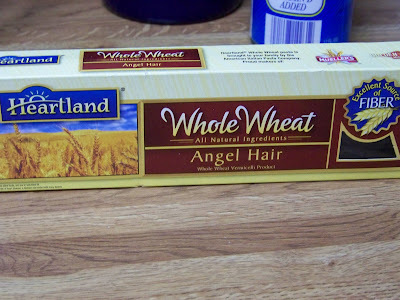 We use whole wheat pasta, 'cause that's how we roll. Or maybe it's so we won't roll so much. I don't even know what that means. Anyway, it's really good and good for you, too. I usually use about 12 ounces, but I don't have a set amount, just use as much as you want to. How's that for precise measuring? When you put your water on to boil, throw some salt in the water so that you have already salted your pasta and you won't have to salt the finished product. I think you consume less sodium that way, but how should I know? Man, I'm really sarcastic today, aren't I? Anyway, I think I use probably a tablespoon in my water. I know that sounds like a lot, but remember, this the water we're salting, not the pasta itself. Back to the task at hand. 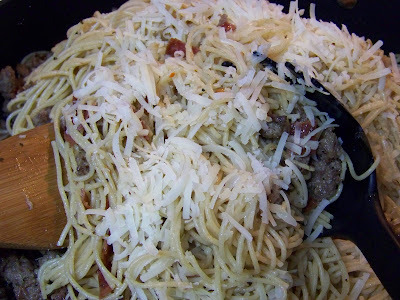 While your meat is browning and your pasta is boiling, go ahead and grate some Parmesan cheese. DO NOT USE POWDER. Come on, people, get the real stuff! It tastes SO much better than the round box stuff. 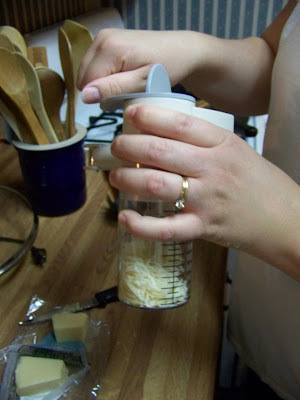 This is me grating cheese in my beloved Pampered Chef cheese grater. Only, the handle is broken so I'm having to hold it funny. And hold it I will until I can afford another Pampered Chef cheese grater. It's that good. Okay...grate about a cup. Then open up one of these. 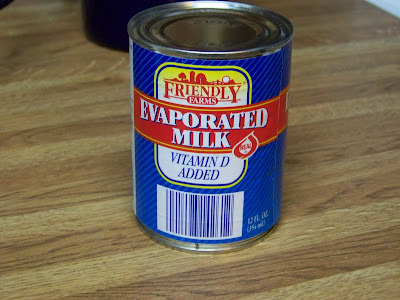 ...and evaporated milk. Now just let it simmer, stirring it all really well to get it all mixed in. Simmer and stir until the liquid is reduced and the mixture is almost creamy...about 5 minutes or so. Don't over cook it or it will not be creamy, it will be sort of sticky. Still delicious, but not as nice a presentation. And here you go. Finished product. I don't think I can convey how good this stuff is. My Kiddo regularly asks for it, and that's saying something. I mean, he's not a picky eater, but he'd rather request McDonald's than something I make. So I know something's a hit when he asks for it. Here's the recipe fo' realz. 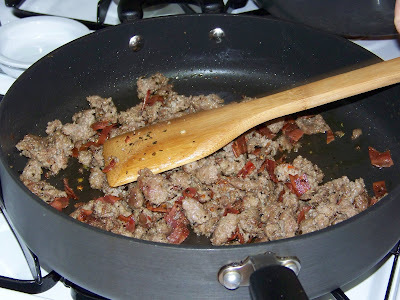 In a skillet brown sausage with bacon, spices, and garlic until sausage and bacon are no longer pink. If there is a lot of grease after you're done browning, drain some off. Leave enough to just barely coat the bottom of the skillet. While the meat is browning, boil pasta, adding salt before boiling. Drain boiled pasta. 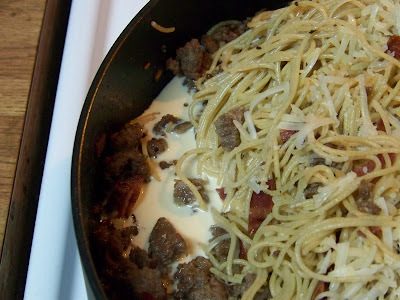 Combine meat mixture, pasta, cheese, and evaporated milk and mix well. Simmer until liquid is reduced and mixture is creamy, 5 to 7 minutes, stirring well. That's it! It's super, super easy, fast, and delicious to boot. Thank you so much, Heathahlee! Now to all you other wonderful cooks: if you have a recipe you'd like to share in the Dinner for Real series, please let me know! Richella, I love this Dinner for Real series, every recipe has looked delicious (haven't tried them all yet:)!!! Keep it up!! Hard to go wrong with bacon, cheese AND pasta! OH...this is my kind of recipe! 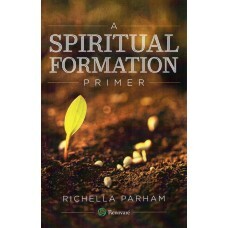 Thanks so much Richella. It looks and sounds easy...and Yummy! Hi...I'm a follower of Beneath My Heart, and she sent me here, and now I'm a follower of yours. Please know my thoughts and prayers are with your husband, you, and your entire family. I pray God's love will give all of your comfort. YUM! I love spaghetti carbonara, but frankly the raw eggs always freak me out a little. I really don't want salmonella. Thanks for sharing. I've bookmarked it for later. Hey Richella, just happened over today after seeing your roman shade on Traci's blog. Love it! I'm praying for your husband's surgery. Hang in there and know that we are thinking about you all. I hope he gets better soon so we can do that dinner soon. P.s. You should contact Pampered Chef to get a new grater, I believe all their products have a lifetime guarantee! This sounds so good! I love a recipe that uses few ingredients like this one but still is quite flavorful. I can smell it down here in SC! I see you shop at Aldi, too! (I hate hate loathe despise hate) powdered, canned Parmesan, always grate mine fresh, too--I have discovered the grated Romano at Aldi (have you? )- it's in the refrigerator section- it is wonderful- you should try it! (Are you staying warm up there? We had frost last night, after planting our garden this past weekend-ugh). hi Richella, I am a follower and I am enjoying all your dinner for real posts, it;s truly wonderful. Thank you, Emelia. this looks so easy and delicious...I copied and plan to make it..mmmmgood! It looks tasty. I've never tried anything like it before. Can't wait to try it!! BTW...saw your no sew Roman Shades over at Traci's blog & was quite impressed :) Both your shades & your kitchen are BEAUTIFUL!! Lifting your family up in prayer, Kim B.